Students in all levels practice capsizing and righting their boat, a key safety skill for all sailors and most of the kids favorite part of camp. Have you ever had the experience beloved young adult author Gary Paulsen describes above? That moment when, in the quiet of the water, your sail fills and you feel the power of the wind pull you forward? You feel just on the edge of control and the thrill is delicious. 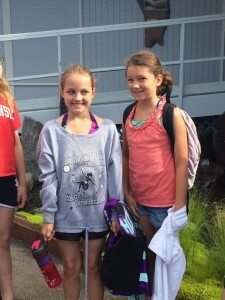 Two Lil’ Luffers, Emma Krug (left) and Molly Scriven, prepare for their first day on the water in the Olympia Yacht Club’s Junior Sailing Program. My daughter had the chance to feel that thrill for the first time last summer when she enrolled in the Olympia Yacht Club’s Junior Sailing Program. Not only did she learn to sail, but she sailed – by herself. That sweet success prompts a return this year, and she is eager to sail, capsize, and feel the wind on her face once again. The Olympia Yacht Club has been offering sailing instruction for youth from its Budd Bay location for years. In cooperation with the Olympia Parks and Recreation Department, the program is open to children as young as five years old and includes a fleet of Optimist Prams, 420s and Lasar sailboats. The junior program is divided into three age brackets stretching from age five to 18. All participants must pass the swim test and provide their own lifejacket. The Harbor Mice (ages five to seven) sail in the eight-foot Opti sailboats, an easy to maneuver sailing dingy great for beginners. Lil’ Luffers (ages eight to 11) are first time and novice sailors. 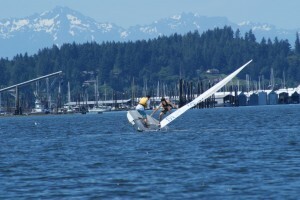 Lil’ Luffers use the Opti, the single-handed Laser, and the double C420 to sail with a friend. The Junior Jibers (age 12 to 18) are more experienced and instructors work to place them with partners and groups matching their level of knowledge. Sessions for all levels run weekly throughout the summer and all students learn boat basics with “classroom” time on the docks as well as time on the water each day. Click here for a full list of sessions. 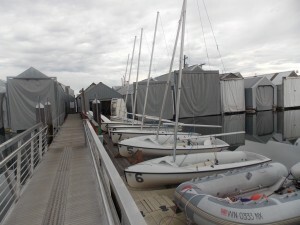 The OYC hosts a fleet of small one and two-person sailing dingys perfect for novice sailors. Two new camps are offered this year for advance sailors. The “Learn to Race” and “Intermediate/Advanced” camps offer added challenge and instruction for kids wanting to take their sailing experience to the starting line. Junior sailors will take their base sailing knowledge up a notch with specific instruction on race technique, culminating in the Mt. Baker Milfoil Dodger Regatta on Saturday, August 8. And the beauty of the Puget Sound is a reason many of us call Thurston County home. With miles of shoreline and endless coves and points to explore, sailing is one of the top recreational pastimes in the area. That’s a valuable lesson that junior sailors, senior sailors, and all those in-between can learn on the water and bring back with them to dry land. To register for summer programs, visit the Olympia Parks and Recreation website. Click on “Outdoor Camps” for a drop down of specific options.